Barbara Brown Taylor is an Episcopal priest, teacher, and bestselling author of fourteen books on religion and spirituality, including Leaving Church, An Altar in the World and Learning to Walk in the Dark, which was featured on the cover of Time magazine and named one of the best religion books of 2014 by Publisher’s Weekly. She has served on the faculties of Piedmont College, Columbia Theological Seminary, Candler School of Theology at Emory University, McAfee School of Theology at Mercer University, and on the Certificate in Theological Studies program at Arrendale State Prison for Women in Alto, Georgia. She has been recognized by Baylor University as one of the top twelve preachers in America, and in 2015, she was named Georgia Woman of the Year. Her latest book, Holy Envy: Finding God in the Faith of Others, was just published in April 2019. Following the Forum, join us for a public reception and book-signing. For more details, visit westminsterforum.org. The countries of Mozambique, Zimbabwe and Malawi have been ravaged by Cyclone Idai and the heavy rainfall that followed. The Presbyterian Disaster Assistance (PDA) is partnering with ACT Alliance to assess and respond to the needs of those who have been displaced by the cyclone and flooding. In April we will receive the One Great Hour of Sharing Offering to benefit PDA or you may use this link to make a contribution to the PDA recovery work in southern Africa. Four guest speakers will share their perspectives on issues confronting our nation in 2019, from challenges and changes in rural America to proposals for gun policy reform to unpacking headlines in the news to understanding the tenets of diverse faith traditions. Music precedes each forum a half hour in advance, and a public reception follows. Forums are free and open to all. Art Cullen is editor and co-owner of The Storm Lake Times, a flourishing, family-owned, twice-weekly newspaper founded in 1990 in Northwest Iowa. In 2017, Cullen was awarded the Pulitzer Prize for Editorial Writing for a series of columns indicting corporate agri-business for polluting the rivers and lakes in the most intensively farmed land in the world. His recently published book, Storm Lake, chronicles his life as a journalist and describes the changes in politics, agriculture, climate, and immigration that are confronting his community and rural America. A graduate of the University of St. Thomas, his commentaries have been published in The New York Times, The Washington Post, The Guardian, and the StarTribune. David Hogg is a survivor of the 2018 mass shooting at Marjory Stoneman Douglas High School in Parkland, Florida. He is among 20 Parkland students who founded Never Again MSD, a gun control advocacy group, and he is a founding member of March for Our Lives, one of the largest youth-led movements in the world. An advocate for ending gun violence in America, he has traveled the country calling for voter participation, civic engagement, and social activism. He and his younger sister, Lauren, are co-authors of the bestselling book #NeverAgain: A New Generation Draws the Line and contributors to the book Glimmer of Hope: How Tragedy Sparked a Movement, a compilation of writings from the founders of March for Our Lives. Jonathan Capehart is a Pulitzer Prize-winning journalist and member of The Washington Post editorial board, focusing on politics, social issues, and cultural shifts globally and nationally. He is a regular contributor to the blog PostPartisan and hosts the podcast Cape Up. He is a periodic commentator on MSNBC and a moderator at the Aspen Ideas Festival, the Center for American Progress, the Atlantic Dialogues conference, and the Brussels Forum. Earlier in his career, he was an editorial page editor and editorial board member for the New York Daily News, and he served as a national affairs columnist for Bloomberg News. He grew up in Newark, New Jersey, attended St. Benedict’s Preparatory School, and is a graduate of Carleton College. Barbara Brown Taylor is an Episcopal priest, teacher, and bestselling author of 14 books on religion and spirituality, including Leaving Church, An Altar in the World and Learning to Walk in the Dark, which was featured on the cover of Time magazine and named one of the best religion books of 2014 by Publisher’s Weekly. She has served on the faculties of Piedmont College, Columbia Theological Seminary, Candler School of Theology at Emory University, McAfee School of Theology at Mercer University, and on the Certificate in Theological Studies program at Arrendale State Prison for Women in Alto, Georgia. Her latest book, Holy Envy: Finding God in the Faith of Others, will be published in April 2019. These are just some of the powerful statements we have heard in recent months as we have reached out to Scholars from the past 30 years of the Meisel Program. From the first gift of $5,000 to initiate this endowed program, more than $180,000 has been awarded to over 70 young people, allowing them opportunities to travel, learn, explore, discern, experience, and grow in their faith and vocational development. On Sunday, January 6, we celebrated the first three decades of this program, which forms the foundation of Westminster’s vocational ministries. It honors the legacy of the Rev. Dr. Donald and Eleanor Meisel and invites young adults in our congregation to further Westminster’s mission as they follow their convictions, share their talents, and explore their vocations outside the traditional college classroom. Over lunch after church, we will hear from Meisel Scholar alumni, Meisel Committee members, and adult mentors. We heard from Scholars who traveled to Cuba, Israel, Romania, Thailand, Peru, Ghana, and Brazil, as well as the stories of those who partnered locally with non-profits, conducted research, and furthered the common good. The Mpls Downtown Improvement District (DID) announced its 9th annual Greening & Public Realm Award winners, a group decided by an interactive public vote. The Greening Awards aim to showcase greening efforts by organizations and companies that help beautify the downtown area through enhancing our urban landscape. This summer’s voting turnout was the largest in Greening Awards history, nearly doubling the 2017 voting numbers. Westminster Presbyterian Church, which last won a greening award in 2012, won two awards this year, claiming top spot in the Small Green Space and Public Realm Improvement categories. Winners will receive a commemorative Greening Award created by Wood from the Hood, a Minneapolis-based company that reclaims discarded trees from urban neighborhoods and creates high-quality wood products. Each award will display the year the award was issued. Winning locations also received a Greening Awards winning logo placed on site. The Mpls DID accepted public nominations for green spaces throughout August, and finalists were announced on August 28. Voting for finalists remained open through September 14. The finalists, nominated by the public, were selected by members of the Mpls DID staff based on criteria including overall year-over-year enhancements as well as continued excellence in adding vibrancy to the public realm. A panel of local women entrepreneurs will discuss their fascinating array of work at TownTalks Thursday, November 29. These young, innovative women are setting the stage for future women entrepreneurs, small business owners, and CEOs. Hear what motivates them to write, form businesses, and express creativity in fresh, dynamic ways. Panelists include Melissa Coleman, Ashley Mary, Carly Van Veldhuizen, and Alex West Steinmann. Minnesota Public Radio reporter Marianne Combs will moderate the discussion. Happy hour begins in Westminster Hall at 5 pm with appetizers and a cash bar, followed by the panel discussion at 6 pm. The event is free, and no registration is required. Learn more here. An initiative of the Westminster Town Hall Forum, TownTalks is a new program engaging young adults in reflection and dialogue on the key issues of our day. Westminster’s Racial Justice Work Group (RJWG) began meeting in January 2017 in face of the sharp rise in overt racism nationally and here at home. After a year of thoughtful discussion and soul-searching, we believe that Westminster must pledge to take actions that respect each of our stories yet gives all a voice in policymaking. We must build strong relationships with our community neighbors and work vigorously to dismantle public policies that persist in oppressing and prohibiting our brothers and sisters of color from achieving equality of opportunity in life. To build these strong relationships, we are motivated by our faith in the beloved community envisioned by Jesus. To foster the kind of racial reconciliation that is consistent with the teachings of Jesus, we must be an active and listening presence in our community. We hope many of you will want to join in. To move forward, the RJWG has some questions we’d like you to answer. Your responses will help us gain a sense of what types of programs/activities might appeal to you. We want to hear from church members of all ages and in all life stages so we can offer programs and activities that will most engage and motivate our congregation in this important ministry. Please answer the questions honestly and as candidly as possible. There are no right answers; we want genuine feelings and opinions. PC(USA) will help recovery effort in Florida panhandle, southern Georgia and southeast U.S.
Hurricane Michael was a strong Category 4 storm blowing winds in excess of 150 mph when it made landfall near Mexico Beach, Florida, Wednesday afternoon. 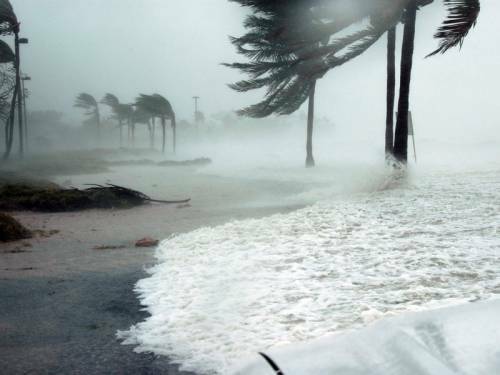 It’s the strongest storm to hit the U.S. since Hurricane Andrew in 1992. Michael left much of the Florida panhandle coast in ruins, including Panama City, which was forced to evacuate hundreds of patients from its two hospitals, including intensive care patients. A FEMA official was quoted as saying that Mexico Beach was “wiped out.” Two deaths have been reported so far, a man in Florida and a girl in Georgia, but rescue crews fear more will be added to the death toll as they begin cleaning up the debris. The fast-moving storm had cut a swath through southeast Alabama, Georgia and the Carolinas by Thursday morning. It’s expected to dump from four to nine inches of rain on the already soaked Carolinas, a region still reeling from flooding as a result of Hurricane Florence last month. More than 300,000 residents are currently without power in Florida, Georgia, and Alabama. Kraus and her colleagues in the Presbyterian Mission Agency and throughout the Presbyterian Church (U.S.A.) are working with our partners to meet immediate needs and support long-term recovery. Presbyterian Disaster Assistance is the emergency response and refugee program of the denomination, committed to the long-term journey of recovery of communities adversely affected by a crisis or catastrophic event. It is funded by the One Great Hour of Sharing and has designated funds for responding to specific disasters. To support recovery efforts in the wake of Michael and Florence, click here. You’ll be taken to the PC(USA) website to donate securely and quickly. You may also call Monday through Friday, 8 a.m. to 6 p.m. (EST), at 1-800-872-3283 and donate by phone. Visit pda.pcusa.org for continuing updates. Presbyterian Disaster Assistance (PDA) urges your support for those affected by Hurricane Florence. PDA is delivering immediate aid to those impacted by the storm on the Eastern Seaboard of the United States. Initial assessment suggests catastrophic destruction, but the full scope of the damage will not be known for many months. Through your prayerful gifts, we draw hope out of the chaos. Learn more here.